Written and directed by Samuel Fuller, The Big Red One is the story of a platoon dealing with war during their campaign in Europe and North Africa during World War II. Based on aspects of Fuller’s own experiences as a soldier, the film is an in-depth look of what goes on in the battlefield where a young platoon follows its leader to survival as they deal with the horrors of war. Starring Lee Marvin, Mark Hamill, Robert Carradine, Bobby Di Cicco, Kelly Ward, Siegfried Rauch, Marthe Villalonga, and Stephane Audran. The Big Red One is an intense and gripping film from Samuel Fuller. 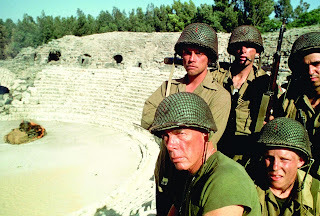 The film follows the 1st Infantry Division during World War II from their campaign in North Africa in November of 1942 to the liberation of the Falkenau concentration camp in May of 1945 led by its sergeant (Lee Marvin). The film follows a sergeant and four men from his platoon as they deal with their many campaigns in the span of nearly three years as it’s largely told by a wannabe-novelist in Private Zab (Robert Carradine) who is the film’s narrator as he is joined by the sharpshooter Private Griff (Mark Hamill), the Italian-American Private Vinci (Bobby Di Cicco), and the medic Private Johnson (Kelly Ward). Samuel Fuller’s screenplay begins with the sergeant fighting in World War I as he would learn the war just ended after killing someone at a place in France which he would revisit years later. Fuller’s screenplay doesn’t really have much of a plot as it would delve into an episodic narrative of sorts as it follows the sergeant and his platoon into different adventures in the course of their time in Europe and North Africa. Yet, Fuller is more interested in the comradery between the sergeant and his four privates where the sergeant doesn’t really act like some leader who barks orders but rather a soldier who knows what to do and make sure his men aren’t killed. At the same time, he’s kind of a father to them as he would let them get away with a few things but always keep them in check. Especially Pvt. Griff who has a hard time coping with the idea of killing someone as the sergeant reveal some of the dark and cynical aspects of war that is quite true. The script also has a subplot relating to a German officer named Schroeder (Siegfried Rauch) who is a counterpart of sorts for the sergeant as they would encounter each other from time to time during battles yet never meet each other directly. Schroeder is an interesting antagonist who has an undying sense of loyalty to Hitler and the Nazis but has a hard time accepting criticism of their ideals. Fuller’s direction is definitely intense in terms of some of the battle scenes and action though Fuller doesn’t make it gratuitous nor overblown as it’s often the case with a lot of war films. Shot largely in Ireland with the North African locations shot in Israel as well as some of it shot in California, Fuller explores the different kind of obstacles the sergeant and his men would endure throughout the course of the film. While Fuller would use a lot of wide shots, along with some medium shots, to capture the scope of the locations. It’s in the close-ups and extreme close-ups is where Fuller captures the human aspects of war whether it’s a soldier looking at some of the horror or scenes of them observing their surroundings. Even if it’s moment of fun such as a scene late in the film where Pvt. Zab has a party for the platoon at a house in Belgium as it’s a moment of joy and fun. Fuller would create scenes that are odd as it help give the film a different tone that is often synonymous with war films. The sequence at an insane asylum where the sergeant and his men meet a woman who is part of the French Resistance would be this mixture of dark humor and suspense that show what the 1st Infantry Division had to do. It’s among some of the offbeat moments in the film as well as what some soldiers have to use to protect their rifles in the water. Yet, Fuller does maintain some realism as it relates to the horrors of war as well as some of the humanity as it relates to the people the sergeant and his platoon encounter. Though some of it is dark, Fuller does show moments of compassion such as a little moment where a young girl puts flowers on the sergeant’s helmet or the film’s climax at the concentration camp in Czechoslovakia. Overall, Fuller crafts a chilling yet captivating film about the 1st Infantry Division’s adventure during World War II. Cinematographer Adam Greenberg does excellent work with the film’s cinematography as its usage of soft-lights and naturalistic photography for some of the daytime exteriors help give the film a beautiful look including some chilling moments involving some of the violence in the film. Editor Morton Tubor, with Bryan McKenzie for the 2004 reconstruction, does brilliant work with the editing as it is largely straightforward without emphasizing too much on style. Art director Peter Jamison does fantastic work with the look of some of the sets including a big cross that the sergeant would see reminding him of his time in World War I as well as the interiors at the asylum. Sound editor Jack A. Finlay, with sound designers Mark Linden, Tara A. Paul, and Harry E. Snodgrass for the 2004 reconstruction, does superb work with the sound in capturing some of the horrors of war including the sounds of bombs and gunfire. The film’s music by Dana Kaproff is wonderful for its orchestral-based score as it play into some of the dramatic moments of suspense as well as some offbeat moments in the film in some light-hearted pieces. The film’s marvelous cast include some notable small roles from Christa Lang as a German countess Schroeder sleeps with, Pascal Bruer as a Hitler Youth member, Galit Rotman as a pregnant Frenchwoman, Matteo Zoffoli as a Sicilian boy who helps the platoon in exchange for them to help bury his mother, Perry Lang as a young private named Kaiser, Doug Werner as a Polish-American soldier, and Marthe Villalonga as a madam at a Belgium house where the platoon briefly stay at. Stephane Audran is terrific as a French spy pretending to be a patient at an insane asylum as she helps the sergeant and his platoon while befriending Pvt. Griff. Siegfried Rauch is superb as Schroeder as a German officer who is kind of the counterpart for the sergeant as they share similar views on war yet he is someone that is truly devoted to Hitler as he will kill those who says something bad about him. Kelly Ward is excellent as Pvt. Johnson as a farm boy who has experience in being a doctor as he tries to cope with the chaos of war as well as be someone who is very loyal to his platoon. Bobby Di Cicco is fantastic as Private Vinci as an Italian-American who says some of the film’s funniest things while being quite tough in dealing with the enemy. Robert Carradine is brilliant as Private Zab as the film’s narrator as someone who provides some humor as well as witty commentary on things as he’s using his experiences for a book. Mark Hamill is amazing as Private Griff as a sharpshooter who has a hard time with the idea of killing someone as he would display some humility and weariness as someone who would see a lot as he copes with some of the darkest aspects of war. Finally, there’s Lee Marvin in an incredible performance as the sergeant as a man who has been through a lot of wars as he tries to maintain some sense of morale as well as be someone who knows what not to do as it is really one of Marvin’s career-defining performances. The Big Red One is a phenomenal film from Samuel Fuller. Featuring a great cast, an engaging story about what men go through in war, dazzling technical work, and a fantastic music score. It’s a war film that doesn’t exactly play by the rules while displaying elements of humanity and comradery that is often missed in war films. In the end, The Big Red One is a spectacular film from Samuel Fuller. I've never heard of this, even with Mark Hamill's name attached. I'm glad you liked it! I watched War Machine on Netflix recently and it was a disappointment. It got me thinking about what makes a good war movie, and whether those old techniques can still hold today when our method of fighting war has changed so much. You'll never go wrong with great acting though, and Brad Pitt didn't deliver. @Brittani-It's a film that isn't shown very often as it's also a film that had a troubled release because the studio decided to cut a lot of the things out of the film that really hurt. It took a long time for the film to be shown in the way Fuller meant it to be shown as it's worth seeking out. @assholeswatchingmovies.com-I'm not interested in War Machine as it looks kind of dumb for my tastes. I'd go with this film and make sure it's the reconstructed version with a 163-minute running time. It's worth it. I don't wanna hear any complaints about "oh it's too long" or "oh, it's too slow". Some films are meant to be those things.